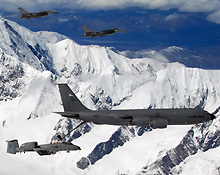 Eielson AFB is located 26 miles southeast of Fairbanks, in the interior of Alaska, about 110 miles south of the arctic circle. Fairbanks has about 88,000 people and boasts many of the services you would find in a similarly sized city in the lower 48. The city of North Pole, where the spirit of Christmas lives year round, is located just 8 miles from Eielson. North Pole is a small friendly community with a basic selection of services such as: dining, service organizations, parks, churches and events throughout the year. Eielson boasts hiking, fishing, canoeing, dog mushing, cross country skiing, snowmobiling and some of the best Northern Lights Shows in the world.